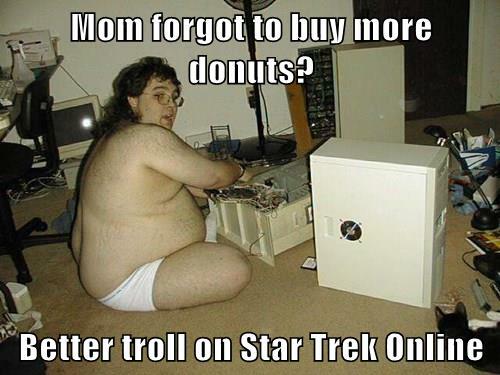 The following is a list of know trolls along with their known offenses for the game Star Trek Online. This list will change as needed. Note that some of these names are purposely created to impersonate legitimate players so make sure you look them over carefully. If you know of a troll causing problems in the game, feel free to submit their name and offense to me along with supporting screen shots / videos. While not all this list might be seen as a troll, they are certainly people you want to avoid. Dizi@railrokh | Starfleet Dental | Purposely failing optionals, purposely not trying in a run. @joecool82 | Unknown | Purposely halting runs, spamming map and challenge invites. Impersonating. @zztroi | Unknown | Spamming channel invites, spamming challenges and map invites. Impersonating. @Olivia21L | Unknown | Spamming channel invites, spamming challenges and map invites. Impersonating. @diabolica191 | Unknown | Spamming channel invites, spamming challenges and map invites. Impersonating. @diabo1cal91 | Unknown | Spamming channel invites, spamming challenges and map invites. Impersonating. Boomer@Swiftyboxer | Unknown | Tells people he has cancer to try to get free items. @supermansgirl | Unknown | Massive begging, guilting people into giving free items.